If all goes according to schedule, I land in Hanoi in the evening (via Seattle and Seoul) of my “first” day (without any delays, I will be traveling for about 36 hours, so I’ll technically be well into my second day!) and will grab some sleep in my hotel in the Old Quarter before getting up early to enjoy a sightseeing walk around Vietnam’s capitol city. Hanoi is the only city I have just one day in, so this is also the only “regimented” day of sightseeing to make sure I hit everything I want to see (I did it in Paris and Munich; I can do it again!). With two to three days everywhere else, I know the highlights I want to hit, but I’ll take things as they come in those cities; with such a long trip, it’ll be the only way to keep my sanity and not run myself into the ground from exhaustion! Dawn is supposed to be magical in Hanoi, and since this is my only shot, I plan on being out the door at 6 a.m. to enjoy a walk around Hoan Kiem Lake, the French Quarter, and the Ba Dinh District, which is where the Ho Chi Minh Mausoleum, Museum, and Residence are located. The Temple of Literature, a university nearly 1,000 years old, is located there, and I cannot wait to visit. If I have time, I may pass by the infamous Hanoi Hilton, too. Just in time for dinner, I’ve scheduled a street food tour in the Old Quarter with college kids from Hanoi who do the tours for free and apparently aren’t even allowed to accept tips! They’re just proud to show English-speaking foreigners around their city. I can’t wait to experience the amazing Vietnamese street food I’ve been hearing nothing but raves about! After my day in Hanoi, the next two days will be spent in Halong Bay aboard a traditional junk boat. From the pictures I’ve seen, I’m pretty sure this is one of the most beautiful places on Earth! It’s a UNESCO World Heritage Site and has been named one of the Seven New Natural Wonders of the World. I’m psyched! From there, it’s back to Hanoi to catch the Reunification Express overnight train to Hue (pronounced much like “way”), imperial Vietnam’s feudal capital. I can’t wait to explore the Citadel and Imperial City, the Royal Tombs of several emperors, and the Thien Mu Pagoda. I may be most looking forward to a dragon boat ride down the Perfume River! After a couple days in Hue, it’s once again time to hop aboard the Reunification Express and travel down to Danang and Hoi An. Danang is where U.S. soldiers processed in on arrival for a tour of combat in Vietnam, and the world-famous beach they took their R&R at (known as China Beach in America and My Khe Beach in Vietnam) is located nearby. Beach lover that I am, of course, I have a day at the beach planned! I also plan to hit the Danang Cao Dai Temple, the Danang Cathedral, and a museum devoted to Cham sculpture. Cao Dai is a religion established in Vietnam in 1926, and the temples and worship services are impressive. I won’t have time to see the largest one (the Holy See) in southern Vietnam, where the religion was established, so I’m going to swing by the one in Danang for the 6 a.m. worship service. Worship services occur at 6 a.m., 12 noon, and 6 p.m. every day. There’s even a beautiful Cao Dai temple in Texas that serves a large Vietnamese population. The Cham people are an ancient people with a unique blend of influences from Indonesia, India, Malaysia, Bali, and other cultures. The ancient temples and sculptures are supposed to be very impressive, and I can’t wait to visit the museum and some temples outside of Nha Trang. 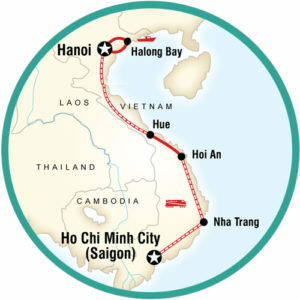 After a morning of sightseeing in Danang, it will be time for the 20-minute journey to the famous tailor town of Hoi An. I am definitely looking to have some bespoke dresses made! During my few days there, I’ll also bum around Ancient Town, take a boat ride to a nearby island for a cooking class, and then partake in a boat/bicycle/sunset BBQ tour. Sounds like heaven to me, and I can’t wait! After my time in Hoi An, it’s time to catch the Reunification Express in Danang and head down to Nha Trang, Vietnam’s premier beach resort town, and a haven for the backpacking crowd. I’m not much of a partier, so I am staying north of the main area, still right on the beach but closer to the Po Nagar Cham Towers and the famous mud baths. I’ll still meander into the busier section, where I’ll indulge in a snorkeling trip to nearby Hon Mun Island. And what do I have planned for my birthday? Nothing. Glorious nothing! It’ll be a relaxing beach day. Then, on the morning of Day 16, it’s time to head for the airport for about another 36 hours of travel back home. I have 15 days In Country, but I’ll actually be gone 18 days total. What’s depressing is that this will be the longest trip of my life (my 17-day wedding/honeymoon trip in 2003 being the longest to date), and I’m only getting to see about a third of what I would like to. I’m definitely going to need to take another trip or two to see the northern highlands (do a Google image search for Sapa—OMG), the central highlands, the Son My Memorial Park (Son My being better known to Americans as My Lai, as in the massacre), the Mekong Delta, and Phu Quoc Island (do another Google image search—OMG). It’s been a few months since I planned this itinerary, but as I write this down, I am getting so freakin’ excited all over again! I sound like a broken record, but I can’t wait!